You have decided you want guppies and who wouldn’t with all of the different varieties and colors available. Now you need a fish tank and a bunch of other things right? Before you get started, you need to ask yourself a few questions. How many guppies will you be getting in your guppy tank? Are you getting all females, all males, or males and females? Now, if you are getting females, you need to ask yourself a few more questions. Do I want fry (baby guppies)? What will I do with all of the fry? Some of these questions may still leave you with more questions, however, we should cover them all by the end. 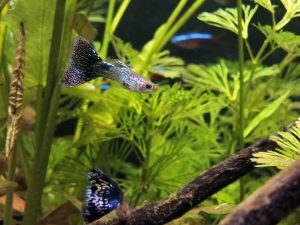 The tank size you get will depend on how many guppies you are planning on getting. On average a guppy will get to be about 2 inches long. If you follow the rule of thumb on stocking your guppy tank, you need 1 gallon of water per inch of fish. So one adult guppy will need at least two gallons of water to be happy, healthy, and comfortable. Guppies do better when there are at least three of them in a tank. Yes, fish can be depressed just as us humans and they do enjoy the company of other fish. So, for at least three fish you will need at least a 5 gallon fish tank. Any particular brand of tank will work fine for your guppies. It is all a matter of what you like. 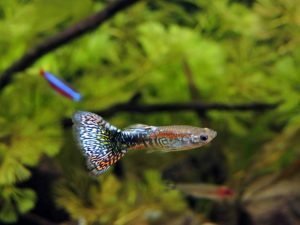 Keep in mind that guppies swim more horizontal than vertical so a long tank instead of a tall tank will be better for your guppies. 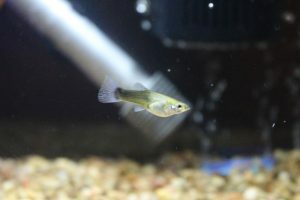 If you are going to have male and female guppies in the same tank you will in fact have fry. A female can have anywhere from 1 to over 100 fry in one birth. This means that your 10 gallon tank can go from having 4 fish to over 100 fish. Granted, for the first 4-6 weeks the fry will not produce much waste and will not take up much space, depending on water quality, feeding, and temperature. After that, you will be getting overstocked quickly. 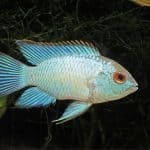 An overstocked tank will create more waste and depending on your fish tank filtration will mean horrible water quality and more water changes needed, fish diseases. An overstocked tank will mean less room for your fish to swim and move, also reduce hiding places, and add more stress to your fish. This could lead to fin nipping and aggressive behavior in your fish. A fry will take about 3 months to have all of their colors show. This means if you are planning on selling them, for 3 months you will need to be able to feed them and allow them to grow. In that three months, your female will drop 3 more batches of fry increasing the number of fish you are the proud new owner of. 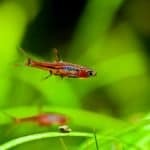 This needs to be taken into consideration when buying a fish tank as this is an important factor to consider when keeping guppies. Even if you buy a female from your pet store, she may in fact be already pregnant and drop fry one day or she is holding sperm to use at a later time and surprise you with a batch of fry one day. 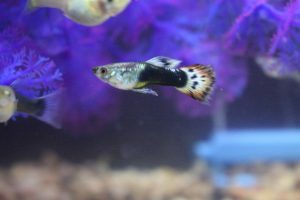 When having a female guppy or guppies, the larger the tank the better. Having a fish tank heater is an absolute must with guppies. They prefer water temperatures between 74 and 80 degrees Fahrenheit. 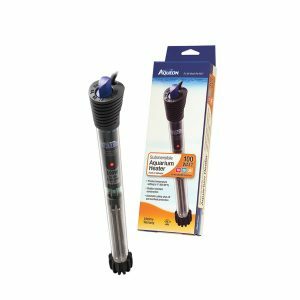 Occasionally you may need warmer water temperatures which makes an adjustable heater the best choice for your aquarium. Keeping the water temperature on the lower end of the preferred settings will slow down their metabolism therefore reduce food consumption and slow down their growth (if you have fry or juveniles). Water temperatures on the warmer end of the preferred temperatures will speed up their metabolism, help with growth and also helps relax pregnant females during the long birthing process. Some medications and some freshwater fish illness that your guppy may get will require warmer water to help combat the infection. Aqueon Adjustable Heater has some great reviews on Amazon. We all know that a tank with plants and decorations is more enjoyable than watching a fish swim in a bare bottom guppy tank. So, what do you put in it? Guppies are not particular to what is on the bottom of the tank. You can have it bare, gravel, or sand. No matter what you decide to put on the bottom, make sure you thoroughly wash it well. Your guppies prefer areas where they can hide in. Just as long as the holes in your decorations will not allow your guppies to get stuck or have sharp points on them they will enjoy. Aquarium plants are great to have as it gives beauty to your aquarium. Live or fake plants will help give hiding spots for fry should you have a female give birth. If there are no plants or not many safe hiding spots that the bigger fish can’t get to, you will lose your fry as the adults will eat them. Plants also help with some hiding spots with the bigger fish, especially those that are being bullied or a female that is getting harassed by a male and needs some escape. To clean fish tank gravel, pour the gravel in a bowl or a bucket. Pour enough vinegar to just cover the top of your gravel. 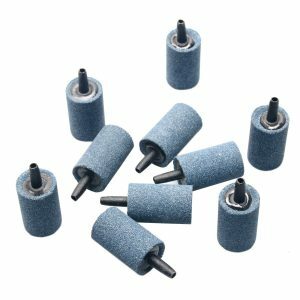 This will help ensure that your gravel is being cleaned properly. Use your hand to move the gravel around like you are stirring them. Dump as much of the vinegar out as you can and start filling up your bowl or bucket with warm water or as hot of water as you can stand you hands to be in constantly for several minutes. While your bowl or bucket it filling up, stir your gravel to help rinse off the vinegar. You will notice the color of your water looking funny. Once you see that your water looks clear, dump out as much of the water as you can and repeat this process to ensure that all of the vinegar is rinsed out completely. Can use this method to clean rocks if you decide to put them in your guppy tank. To clean sand, get an old pillow case to use. It is best to clean sand outside as to not clog up your drains. Pour your sand in the pillow case. Place water hose inside of the pillow case and turn on. This will rinse your sand effectively and ensure nothing is being left on. Let the water run in the pillow case covering all of the sand until the water is running clear out of the pillow case. To ensure that you rinsed it well, stir up the sand with your hand to ensure the water is still coming out clear. Once your water runs clear your sand is ready to use. Guppies are usually a very hardy fish. However, some things will cause them to die quickly and a miserable death. The chlorine in your water for one will poison them and suffocate them. It is imperative that you remove the chlorine from your water. Seachem Prime is a great product. It will remove the chlorine and chloramines from your water and will also help to detoxify the ammonia from your tap water also. It does tell you how much to add to your fish tank, but if something happens and you add a bit too much, there isn’t need to worry about it because its safe. All tanks need bacteria in it. The good kind mainly. 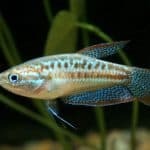 You need to have cycled your guppy tank which means that you allowed an ecosystem to form in your tank where there is no ammonia, no nitrites and under 40 ppm of nitrates in your fish tank. 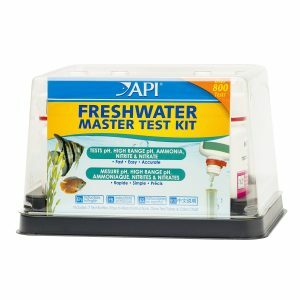 An API Master Freshwater Test Kit will be a necessity to have on hand to help you monitor these three things helping you keep your fish well. 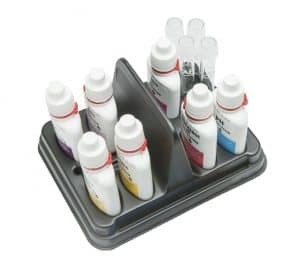 Any liquid freshwater test kit may be used and more accurate than test strips and generally easier to read. 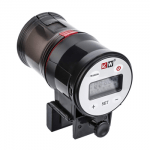 When first cycling your tank and/or after having an established tank, you can also add API Quick Start to the tank. This will help make sure your good bacteria stays in check and also will help with ammonia and nitrite buildup. Guppies are usually very active fish. Especially if there are male and females in your tank. Imagine yourself being active. The more active you are the more oxygen you require. If you do not have that extra oxygen you are tired and listless and generally not feeling well. This is no different for your guppies. Yes, your aquarium filter will move water around creating oxygen for you fish, but that would be equivalent to only running a fan in your home during the summer time. Not much oxygen being created. A bar type air stone such as Jardin Fish Tank Air Bubble or Imagitarium Airstone would be a perfect fit for your tank as your guppies will enjoy playing in the bubbles. 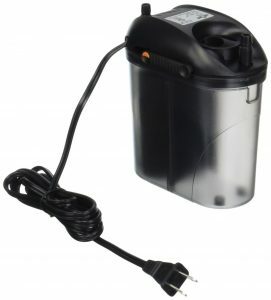 You will also need fish tank small air pump to use with your bubbler. It is wise to get an air regulator with the pump so you can control how much oxygen is going into your tank. Not enough oxygen then the bubbler is useless. Too much then the waves just push your fish around and stress them out. The size of the pump will be determined by the size of the bubbler you are adding to your guppy fish tank. The longer the bubbler, the stronger pump you may need. If you purchase a complete tank set, you can use the lights that come with the tank. Unless you are growing tropical aquarium plants that require certain lights then any LED light will work for your fish. This is a preference on the owner as to what kind of light to use. Just like with us humans, we require light and dark. Light tells our body that it is time to be awake and moving. Darkness is rest and relaxation time. It is just as important for your fish to have day and night in their tank as it is for you to have day and night. Your fish should have the lights off anywhere from 8-10 hours a day. This will allow them to go dormant/sleep and not be so active with the lights off and can help with healing and stress relief from being chased by other fish. You can either set an alarm to help you remember to turn your guppy fish tank lights on and off for you fish pretty close to the same time every day or you can get an aquarium timer power strip such as Century Surge Protector and Timer. These will allow you one less thing to worry about especially if you work late at work or want to sleep in on the weekends. The timer will also help your fish have a routine of sleeping and being awake. Aside from the overall water quality that you are adding to your guppy tank, filtration is just as important and will help with water quality. 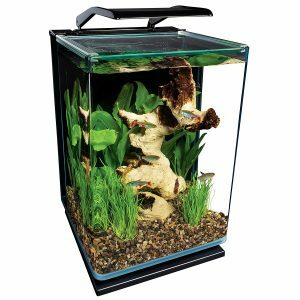 Amazon sells aquarium kits. Inside is the tank, light, hood, filter, and filter cartridge. Unless you are only planning on having three or four males in the guppy tank with no other fish, not even a pleco, I wouldn’t use the one provided with the tank. Guppies create a bio-load just as every other fish does. However, they tend to have a great deal of ammonia problems in the tank from their feces. The best way to combat ammonia problems that your guppies will create would be to have a filtration system double the size of the fish tank. If you have a 10 gallon fish tank, a filtration system for a 20 gallon fish tank may prove to be more helpful. 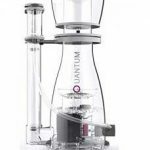 There are many filtration options available for your choosing such as the filters you see hanging on the back of the tank and canister filters. Which ever filter you decide to use, make sure that you rinse of the filters before adding them in the guppy fish tank. Use old water that you took out of your guppy tank to help with the good bacteria build up and not introducing more ammonia or chlorine from your tap water. Check our articles about guppy fish care and guppy fish breeding. After all of this is done, you can add your fish and sit back and enjoy the show they put on for you.